Everytime I mention precious metals it seems to cause a controversy. Personally, I think that if you have your food and other preps, it doesn’t hurt to have some of your money invested in precious metals. The one statement that is always quoted to me is “you can’t eat it and no one will trade for it”. Under some circumstances this is probably correct, but there are other situations in which it will be very tradable. Prior to a complete collapse, I believe that there will be a period in which we will have massive inflation. During this time, if you have precious metals you may have the opportunity to make some very advantageous trades. Also, after the collapse is over and the situation has stabilized having money will help you reestablish your life. Here is a link to an article that we posted in the past that may help you decide what to do. Now is a Good Time to Buy Precious Metals, Lately the price on silver and gold has been down, but I believe this will change in the near future. The way the government is currently handling the economy will eventually lead to hyperinflation. One thing that I want to mention a second time is that I believe that owning precious metals is only part of your preparedness plans. 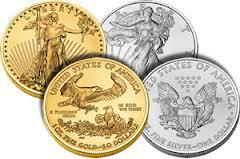 You should only purchase precious metals after you have acquired food and other necessities of life. Also, never borrow money to finance the purchase of gold, silver or other preps. This entry was posted in Self sufficiency, Uncategorized and tagged precious metals. Bookmark the permalink.